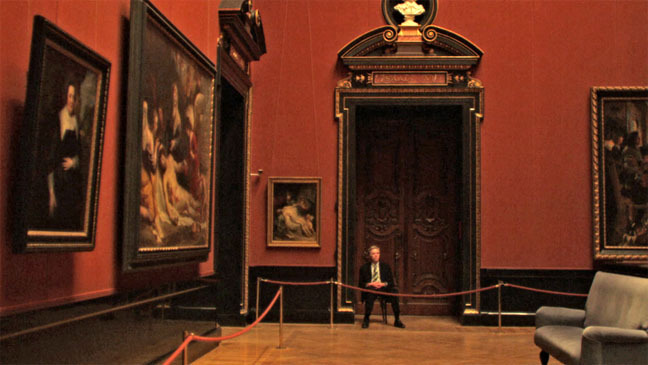 As one observes the fine details of a painting, writer/director Jem Cohen studies everyday Vienna and the core friendship of his latest feature, Museum Hours, with a pleasant sense of naturalism. Set predominantly in the beautiful Kunsthistorisches Art Museum, equipped with a grand collection of priceless works, Cohen offers an intriguing perspective on an environment where humans surrender themselves to the transformative power of art and search for personal meaning. This heartwarming tale follows two strangers from different cultures that connect through their shared isolation and respective opinions, which in-turn assist their individual dramas. We are introduced to a middle-aged museum guard named Johann (Robert Sommer), a kind, polite and soft-spoken gentleman, who narrates intermittently throughout. He reveals some of his fascinating experiences. He talks about his daily rounds, the regularity of questions about mundane things like toilet locations, and how his studies of the artworks often reveal something new each time. To the guests he is practically invisible – and the way that Cohen (who also shoots and edits this film) captures the various museum guests, it appears that he is invisible too – fading into the architecture and lingering around the lecture tours.